Haven't made it to the National Zoo this holiday season? 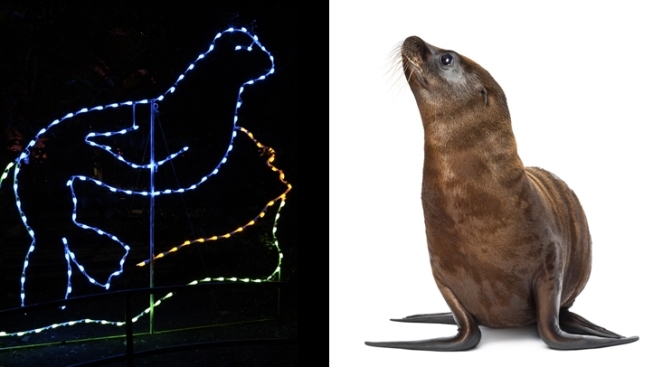 Catch up on what you're missing with our 12 Days of Zoo Lights. From Nov. 23 to Jan. 1, the zoo is illuminated with a sparking light display featuring sculptures of many of the zoo’s most popular animals. We're sharing one with you each day. Habitat: California sea lions are native to the North American Pacific Coast. At the zoo: There are four California sea lions at the zoo -- Summer, Sidney, Calli, and Sophie. They live in the newly created American Trail with two brown pelicans. Zoo history: Calli and Summer took a brief hiatus from D.C. and stayed in Pittsburgh while a new habitat was built for them. Calli’s daughter, Sophie, was born in 2011 at the Pittsburgh Zoo, and joined Calli and Summer when they returned. Bet you didn’t know...California sea lions can reach speeds of up to 25 mph in the water and are considered the fastest pinnipeds.